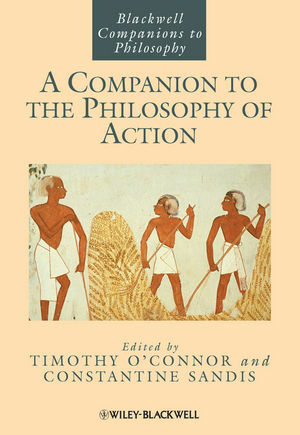 A Companion to the Philosophy of Action offers a comprehensive overview of the issues and problems central to the philosophy of action. Timothy O'Connor is Professor and Department Chair of philosophy at Indiana University Bloomington, and a member of its Cognitive Sciences program. He has published extensively in metaphysics, philosophy of mind and action, and philosophy of religion. His books include Agents, Causes, and Events: Essays on Indeterminism and Free Will (ed. 1995), Persons and Causes: The Metaphysics of Free Will (2000), Philosophy of Mind: Contemporary Readings (ed. 2003), Theism and Ultimate Explanation: The Necessary Shape of Contingency (2008) and Downward Causation and the Necessity of Free Will (ed. 2010). Constantine Sandis is Senior Lecturer in Philosophy at Oxford Brookes University and New York University in London. He is the editor of New Essays on the Explanation of Action (2009) and Hegel on Action (with Arto Laitinen, 2010), and author of The Things We Do and Why We Do Them (2010).